Mercy Bavuma cut channels to divert the sewage from her property. Vuyo Booi’s home was flooded with sewage that spilled form his inside toilet. The Department of Water and Sanitation recognises 15-19 May as Sanitation Week under the theme ‘Sanitation for health and dignity’. “Sanitation is a condition relating to public health, especially the provision of clean drinking water and adequate sewage disposal. Sanitation is not limited to water borne toilets only. Hence the sub-theme, ‘It’s not all about flushing’, but it also involves practising good health and hygiene and taking care of sanitation facilities,” the Department said in a media statement. In our 5 May edition Grocott’s Mail reported on a sewage blockage and overflow that had affected four homes in and behind Kota Street in Extension 9. In the week before the Workers Day long weekend, Amelia Nikelo’s outside toilet started spewing sewage. 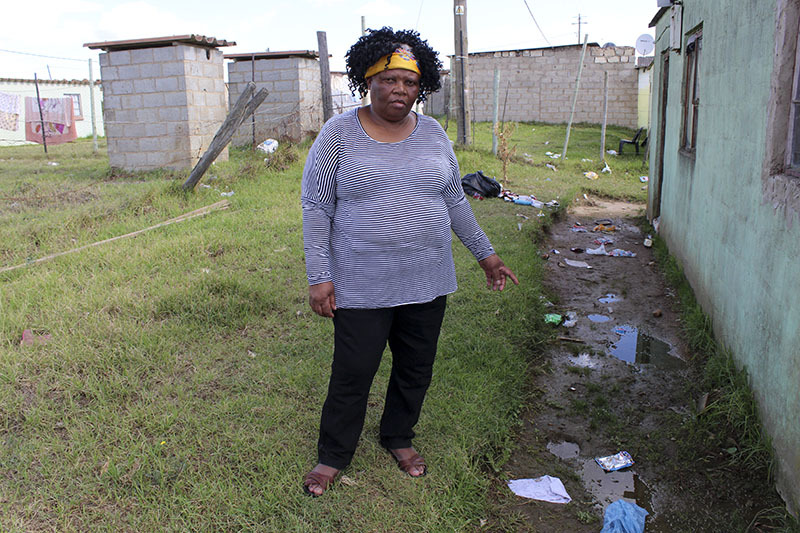 Her neighbour Mercy Bavuma had the problem of overflowing sewage from Amelia’s property coming into her yard. Nikelo went to municipal offices in Extension 6 to report the problem and the next day a plumber and his crew from Makana came and opened the inspection cover in the road off Kota Street, which goes past two of the four affected properties. They unblocked the drain and the spewing stopped. While the sewage had stopped overflowing, the four households were left with different problems. Nikelo (whom the ward councillor for the area, Luyanda Nase visited on Thursday) still had the sewage from Wednesday’s overflow around her toilet. She was waiting for the municipality to bring a substance over the spilt sewage. Mercy Bavuma had cut channels in her back yard so the pools of liquid run away from her house – but then it pooled in the street. The third person wasn’t at home, but seemed to have the same problem as Amelia with their outside toilet. Outside Vuyo Booi’s house next to Xoli’s Tavern, liquid oozed from the toilet outlet and spilled out from his inside toilet, flooding the floor of his home. Where does the responsibility of Makana end and the residents start with respect to such problems? At the erf boundary, internal reticulation and plumbing is the responsibility of the owner. Amelia was speaking about “chalk” that she’d been promised to cover the spillage. Can you please explain what this is and what it does? It’s the white powder called Chloride of lime used to reduce smell and disinfect the area affected by spillage. We are unfortunately out of stock for it but expecting a delivery in the next two weeks. What’s the best way to report sewage blockages/ leaks? Is there a particular problem with sewage infrastructure in Extension 9 – if there is, what is the reason and what are the prospects of fixing it? Extension 9 sewer lines are fairly new andsizeable in terms of capacity. Blockages are caused by foreign objects dumped in the system via a manhole. They would move with the effluent until there is not enough flow or gradient to push, then they cause a blockage at the nearest houses. We are monitoring the area as one of our hot spots.